Boulder International Film Festival: BIFF Buff Guide! CU is @ BIFF this year . . .
BIFF Buff Guide! 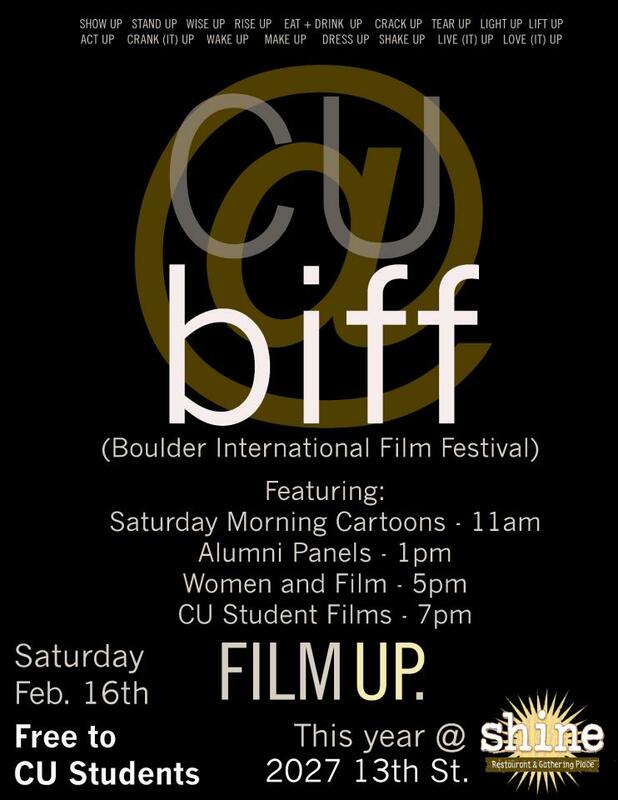 CU is @ BIFF this year . . .
has a perennial option for acquiring knowledge as well. sights and view a different part of the city. is home to a host of amenities perfect for any BIFF attendee. just a guest caught up in the black and gold Boulder spirit. figures to combat blacklisting during the Red Scare. shade and benches ideal for some R&R, the surrounding buildings are also a sight to see. visit to quintessential American poet Robert Frost: His statue graces the south side of Old Main. Macky is a perfect spot to get a taste of CU's theater scene before or after a BIFF screening. seeking a spot to relax. minimal foot traffic, making it the ideal relaxation spot for the weary BIFF attendee.